The Genuine HTML5 website template is a creative design, multi purpose website template coded with Bootstrap 3.0, HTML5 and CSS3. 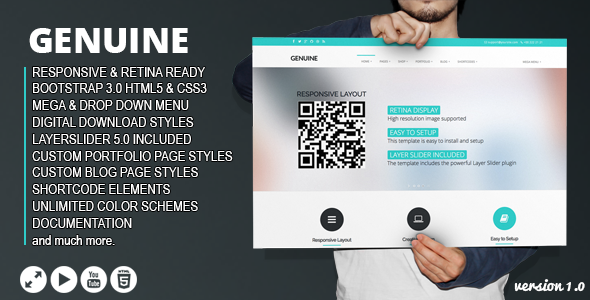 This template 100% responsive and retina display ready. If would you like to build your own portfolio, we recommended you Genuine because this template comes with super awesome features like; 55+ custom page template examples, 5 different homepage styles, custom blog and portfolio page templates, digital download ready products pages, working contact form and much more. It also include LayerSlider 5.0.2 slideshow plugin to the template. You can build amazing slideshows with details documenation of LayerSlider. This template comes with standard turquoise color scheme, but you can build your own! If you want to how? just open colors.css and change turquoise to your color scheme. That’s it. The Genuine HTML5 template features a fully responsive framework that looks fantastic on any mobile device and retina display ready for high-quality resolution graphics. Item Reviewed: Responsive Multi Purpose HTML5 Creative Template 9 out of 10 based on 10 ratings. 9 user reviews.